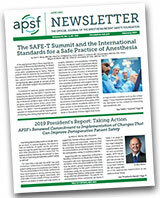 This group of experts discusses the safety questions that are most commonly sent to the APSF website. The purpose of the APSF Network of Safety Experts is to provide expert opinions and recommendations to questions received from the anesthesia community about patient safety issues and topics. If you have a safety question, just mail it to info@apsf.org, then check this page to see if the experts have discussed it. Please note that answers to questions should not be considered to be advice about the care of specific patients. Expert 1: In our institution we do a wide range of difficult cases. Anesthesiologists, residents, CRNA’s, and if necessary, ENT surgeons and others work together in concert in the approach to the difficult airway. No one is alone in a difficult scenario. Expert 2: Our institution has several large volume ENT practices as well as a spinal cord center, therefore, we see a large number of difficult airways each year. We approach patient safety from two fronts. First, we have 1-2 departmental conferences each year dedicated to the discussion of difficult airway management. During these conferences we review the ASA guidelines for difficult airway management and the different techniques available to secure a difficult airway. Second, we have six difficult airway carts available within our operating rooms that are stocked with a wide variety of difficult airway management equipment including intubating LMAs, lightwands and Combitubes. We encourage our staff to use this equipment electively to gain experience with it in non-emergent situations. Expert 3: As part of our resident’s training we spend a considerable amount of time on recognizing and managing difficult airways. This training has didactic and academic components. Academically, we have workshops twice a year (which are mandatory for residents and attendings) on recognizing and managing difficult airways; we cover the use of LMAs and intubating LMAs, esophageal-tracheal combitubes, Flex-guide and Eschman stylets, using the Cook Airway Exchange Catheter via the LMA to intubate the trachea, FOB, cricothyrotomy with and without retrograde intubation and jet ventilation. Of course, we also stress familiarity with the ASA algorithm for difficult airways. We also require the residents to view the ASA videotapes on recognition and management of the difficult airway. Clinically, we practice the techniques taught in the Workshops, with the exception of cricothyrotomy (which we have never had to resort to in the last 13 1/2 years). We also have a rotation in FFOB during which the residents have the opportunity to perform several fiberoptic intubations daily. And we have 2 difficult airway carts available in the OR. Expert 4: We have at least two departmental conferences per year specifically addressing difficulty airways management. We also have a miniworkshop in July each year to demonstrate some of the equipment to our staff and residents. Each July all of our new CA 1 residents participate in a core lecture series; one of the lectures is dedicated to airway management. Finally, we have a rotation for senior residents in Advanced Airways, designed to help them perfect their skills in LMA, light wand , fiberoptic intubation, etc. during routine OR cases. We also have a dedicated difficult airway cart in the OR workroom which has all of the same type of equipment that you describe. We have a difficult intubation cart in the recovery room also; this is of more use to the team who respondsto codes in the hospital. For cases outside the OR, we take a prepared cart for “Special Procedures”, which is kept in our workroom. It contains almost everything one would need to give anesthesia outside the OR. We have two anesthesia machines, dedicated to non OR use, and maintained by us. They are stored in our radiology department, which is centrally located to ct, mri, angio, endoscopy, etc. Expert 1: Anesthesia outside the OR is done with the same anesthesia machines, carts, and technicians as in the OR. Once again, no one is left deserted in a distant location alone for any extended period of time and someone is kept available if help is needed (resident and staff). Expert 2: We have a very active “outpost” anesthesia service that cares for patients in radiology, the cardiac catheterization lab, GI endoscopy suite, and the bronchoscopy suite. We adhere to the same standards in these locations as we do in the operating rooms. An anesthesia machine will be brought to an anesthetizing location if general anesthesia is used and seperate adult and pediatric anesthesia carts are available for use in these areas. Our staffing ratios will vary depending on the age of the patient and the planned anesthetic. Backup personnel are always identified and readily available during the critical portions of the anesthetics. Expert 3: We provide anesthesia services in several locations outside of the main OR (radiology, endoscopy, cardiac catheterization, etc.) With rare exceptions, these are performed during regular working hours (Monday through Friday) so that additional help is always readily available. A resident and attending are assigned to each procedure, and both will stay until the procedure is safely completed. (The patient is then accompanied, with the appropriate monitoring, to the appropriate post-anesthesia care area to recover). They bring an anesthesia machine and cart with them wherever they are going, and whatever special equipment is needed for that procedure. If any additional help is needed, a call to the main OR is all that’s needed. Expert 1: There is no question that an ASA member would have been violating the ASA code of conduct under the circumstances described in this message. I am not aware whether the AANA has a code of conduct similar to that of the ASA. There is probably no violation of laws, except perhaps HCFA’s regulations. Expert 2: The answer to this question is quite clear and obvious. No patient should be left alone (without trained anesthesia personnel present) during any anesthetic. This IS patient abandonment, it is dangerous and should not under any circumstances be tolerated. Expert 1: Line isolation monitors are only required where there are isolated power systems, as identified by section 3-3.2.2.1 of NFPA 99 Health Care Facilities. Isolated power systems are not required in operating rooms, but may be installed in “wet locations” such as cystoscopy; definition of a “wet location” is up to the individual hospital. “Wet locations” may be addressed by either isolated power systems (such as in an OR) or by ground fault protection devices, where power interruption can be tolerated. Expert 1: We use what we call block rooms to initiate regional anesthetics for our orthopedic patients. In these rooms we currently perform spinals, combined spinal/epidurals, and a variety of nerve blocks. Although these rooms are fully equipped to perform a general anesthetic, we do not use these rooms to induce general anesthesia. Safety Expert: This is usually caused by pressure on the mandibular branch of the facial nerve when masking and gripping the face (lower lip or upper?). It might alsoalso be caused by pressure from the mask strap, etc. The nerve is very superficial and can be compressed easily against the mandible, which would explain these symptoms. The installation of the medical gas/vacuum system should have been done in compliance with NFPA 99 (1999), which is available from the National Fire Protection Association. Consult their web page for info on ordering the booklet, if your department or hospital engineering does not have a copy. Any contaminent, for example, bacteria, a virus such as hepatitis B or C or HIV, could be transmitted this way. Studies have shown that red blood cells are present in IV tubing in IVs that are attached to patients. The mechanism that they travel retrograde is called axial diffusion. Smaller particles probably travel farther than the cells. Any way you look at it, there is no guarantee that there is no contaminent in the IV. Tongue studs can only be removed with a special tool. This is probably not easily done in a preop setting and usually requires an official consult from the burly tattoo parlor operator that inserted the stud. Since they are extremely difficult to remove, they are probably no more or less dangerous than other attached mouth appliances (fixed bridges or braces). They are not like earrings, which are meant to be changed. Most patients will not take kindly to having the stud removed as they are difficult to replace. We make the same statements to patients/parents as with dental appliances: there is a risk of damage to the stud although we will do our best to be careful; if broken, there is a risk of the stud being swallowed or being lodged in the airway although we will also do our best to avoid these complications. As with all anesthetic risks for elective procedures, the patient/parent has to agree to accept these risks (or thay can elect to have the stud removed prior to surgery). Why is it necessary to have more than the significant other person in the C-Section OR? Does it improve the outcome of the baby or the mother? How many people are needed to prevent a person from being alone? I think the answer is 1. This is personal and private event for the mother and father and privacy should be respected by friends and family. There might be rare exceptions when another person (parent’s parent or some figure of authority or religious leader) actually helps calm an otherwise distraught or hysterical patient. That might be a justification for another person. There should be a justification of the potential risk that is added. The patient and the spouse should want to minimize risks. C-section is surgery. In my opinion, additional people add to risk of infection, equipment malfunction by running into or tripping over something, touching instruments, getting in the way. The significant other is quite enough distraction. As it is they often video everything anyway. Everyone else can see the videos and pictures. Yes, but additional measures to insure a stable cardiac rhythm are necessary. During passage of the PAC, a temporary right bundle branch block is often induced as the catheter impacts the interventricular septum. Thus, in a patient with a pre-existing LBBB, cardiac asystole may occur. The risk of asystole in this setting is probably in the range of 1 – 2%. Therefore, during insertion of the PAC in these patients, an alternative mechanism to pace the heart must be immediately available. This could include an internal temporary endocardial pacing wire, epicardial pacing wires, or placement of transcutaneous pacing patches (Zoll? transcutaneous pacemakers). Liposuction is now the most frequently performed cosmetic surgical procedure in the United States, utilizing both general anesthesia and MAC. The most common operative technique today is called tumescent liposuction, where large volumes of saline, epinephrine, and lidocaine are infused into the subcutaneous fat, augmenting subsequent aspiration via operative cannulas. While the content of the infusate varies, it typically contains 500 – 1,000 mg of lidocaine, and 0.25 – 1.0 mg epinephrine, per liter of saline. Several case reports have noted patient deaths as a result of unheralded, and precipitous intraoperative hypotension and bradycardia. Two patient who arrested intraoperatively had received total lidocaine doses of 10 and 14.3 mg/kg, with blood lidocaine concentrations of 5.2 and 2.0 mg/liter (determined at autopsy). Other problems associated with this procedure may include: peripheral nerve injury; local infection and sepsis; overhydration, leading to pulmonary edema and respiratory distress; congestive heart failure; pulmonary embolism; fat embolization; and marked hemorrhage leading to severe anemia. There are three major perioperative adverse outcomes associated with a core temperature of < 35.0 to 35.5 degrees C. These include increased risk of wound infection, increased bleeding, and cardiac complications, especially in elderly or other vulnerable patients. One study found a three-fold increase in the incidence of postoperative wound infections in patients who develop hypothermia during colon resection, despite antibiotics in all cases. It is theorized these wound infections are due to decreased tissue oxygenation secondary to thermoregulatory vasoconstriction. Hypothermic patients having hip surgery had a 20% increase in intraoperative and postoperative bleeding. Lastly, this degree of hypothermia increases the duration of the PACU stay, and the thermal discomfort experienced by patients. Thus, this issue also has economic and quality of care ramifications as well. Factors to consider include hemodynamic stability of the patient, immediate airway patency, mental status, rate of blood loss, severity of facial injury, expertise of anesthesia and surgical/ER personnel, the most likely next step in the management of the patient, etc. This is dependent on transfer ventilator equipment available in individual hospitals. The need to maintain the complex regimen and not just “go quickly” is key to the response. This would most likely happen in situations where there are greater than the usual (insignificant) amounts of carboxyhemoglobin (CO-Hb) or methemoglobin (MetHb). The pulse oximeter reading (called the functional saturation) will be falsely elevated compared to a laboratory cooximeter measurement of Hb saturation (called functional saturation). Why? The oximeter measures the percentage of 02Hb and reduced Hb using the relative absorption of only two wavelengths of light. Other hemoglobin types, such as carboxyhemoglobin and methemoglobin are not measured by this method. Conversely, laboratory cooximeters measure 02Hb, reduced Hb, CO-Hb, and MetHb by using at least four wavelengths of light. As a theoretical example, if a patient has 15 gm Hgb, of which 11gm are 02Hb, 3 gm are CO-Hb, 1 gm is reduced Hb, the pulse oximeter reading(fractional saturation) will be the following: 02Hb/02Hb+ reduced Hb, 11/11 + 1 or 11/12, 92% but the Cooximeter (functional saturation) reading will be: 02Hb/02 Hb + reduced Hb + CO-Hb or 11/ 11 + 3 + 1 or 11/15, 73%. Temperature regulation in the newborn is difficult for a variety of reasons. Neonates have a large surfacearea to body weight ratio, less subcutaneous fat and minimal ability to shiver. Rectal temperature probes provide a reasonable measure of core temperature, but placement of the well lubricated probe should be done carefully since rectal perforation is a risk of using this site. Leak of inspired gases around endotracheal tubes may cool probes placed into the nasopharynx, resulting in inaccurate readings from nasopharyngeal probes. Tympanic measurement has been advocated as a measure of central temperature but it is uncertain whether or not tympanic temperature reflects central temperature and there have been reports of tympanic membrane perforation. Esophageal probes will accurately reflect aortic root temperature if placed into the distal third of the esophagus. Placement of lumbar epidural catheters in children is regularly done after anesthesia, because placement in an anxious, uncooperative child is not only painful and frightening but also exposes the child to excessive risk. However, correct placement of the catheter can be ascertained only through indirect means. Test doses are still done in the usual fashion, while recognizing the limitations. Numerous investigator have shown that IV administration of the doses of epinephrine used in epidural test doses lead to inconsistent increases in heart rate in the anesthetized child. In studies which followed blood pressure increase and T wave changes following IV injection of an epinephrine dose equal to that used in epidural test doses, the results have also been inconsistent. Certainly if the vital signs do change intravascular placement should be assumed and the catheter replaced or the technique abandoned. In cases where inadvertent intrathecal placement has occurred, in young children administration of a test dose with a local anesthetic will not lead to a significant lowering of blood pressure. Slight lowering of blood pressure after intrathecal administration of local anesthetics is seen in children older then 7 years of age. Teenagers exhibit the degree of hypotension similar to that seen in adults. Obtaining an Xray (epidurogram) after injection of a small amount of contrast into the catheter may be used to confirm correct placement. In cases where the epidural is crucial for intra and post operative care, fluoroscopy may be used during placement to confirm correct position of the catheter. According to the American Society of Anesthesiologists Closed Claims Data Base, a comparison of adult and pediatric closed claims indicates a large prevalence of airwayrelated damaging events, most frequently related to inadequate ventilation, occurring in children. In particular, respiratory events were more common among pediatric patients (43% in children versus 30% in adult claims). In the opinion of the reviewers, 89% of the pediatric claims related to inadequate ventilation could have been prevented with pulse oximetry and/or end tidal CO2 measurement. However, pulse oximetry appeared to prevent poor outcome in only one of seven claims in which pulse oximetry was used and could possibly have done so. Moreover, in pediatric (compared with adult inadequate ventilation claims), poor medical condition and/or obesity (6% versus 41%; P < or = 0.01) were uncommon factors. Again, according to the American Society of Anesthesiologists Closed Claims Data Base, 16% of claims are for anesthesiarelated nerve injury. The most frequent sites of injury are the ulnar nerve (28%), brachial plexus (20%), lumbosacral nerve root (16%), and spinal cord (13%). Ulnar nerve (85%) injuries are more likely to have occurred in association with general anesthesia, whereas spinal cord (58%) and lumbosacral nerve root (92%) injuries were more likely to occur with regional techniques. Ulnar nerve injury occur predominately in men (75%) and are also more apt to have a delayed onset of symptoms (62%) than other nerve injuries. Spinal cord injuries are the leading cause of claims for nerve injury that occurred in the 1990s. Advanced age, thinness, obesity and the presence of diabetes increase the incidence of perioperative neuropathy. The length of anesthesia or the intraoperative positioning do not correlate with the incidence of this neuropathy but the length of the hospital stay does. Bilateral neuropathy has been reported in 9% of patients. Interestingly, asymptomatic ulnar neuropathy as indicated by nerve conduction studies has been found to be present in the contralateral extremity in almost all patients who suffered from postoperative ulnar neuropathy. Neuropathy can develop in patients who received local anesthesia or light sedation and can occur during hospitalization without surgery. This suggests mechanisms of nerve compression and stretching may occur outside the operating room. Remember that the findings of the Closed Claims analysis may differ from those experienced in everyday clinical practice since this database includes only closed (“settled”) law suits. Yes, however children with myopathic conditions may be susceptible to both malignant hyperthermia and catastrophic hyperkalemia when given succinylcholine. Young children, particularly males under the age of 8, may present with undiagnosed myopathies, such as Duchenne Muscular Dystrophy. Dangerous hyperkalemia can occur and present with sudden onset of life threatening arrhythmias. If this happens after the administration of succinylcholine, hyperkalemia should be strongly suspected. The immediate treatment of life threatening hyperkalemia is the administration of intravenous calcium chloride or calcium gluconate. Calcium is an electrophysiologic antagonist of hyperkalemia and should be the first line treatment. Subsequent administration of glucose, insulin and sodium bicarbonate should also be strongly considered, to facilitate the movement of potassium to the intracellular space. Life threatening hyperkalemia can also occur when in patients who have sustained upper motor neuron lesions, burns, trauma, crush injuries, sustained period of bedrest or immobility, sepsis, stroke, spinal cord injury and progressive degenerative neurological states such as amyotrophic lateral sclerosis. A train-of-four (TOF) ratio of 0.60 correlates with a vital capacity of 55 ml/kg, a negative inspiratory force of 70 cm H2O, and a peak expiratory flow of 95% control values. This degree of recovery allows most patients to cough adequately and maintain a patent airway. Double burst stimulation (DBS) of the ulnar nerve detects 40% fade between the first and the second response, thereby improving the clinician’s ability to detect more subtle degrees of residual neuromuscular block. The clinical implications of residual neuromuscular block are important. Precurarization decreases the TOF ratio to as low as 0.63, may cause difficulty breathing and swallowing, and decreases inspiratory force and peak expiratory flow rate. Even a decrease in the TOF ratio to 0.85 is associated with general discomfort, malaise, ptosis and blurred vision.Other more recent studies with volunteers have shown that TOF ratios of 0.6 to 0.7 are associated with decreased upper esophageal tone and a decrease in the coordination of the esophageal musculature during swallowing. Fluoroscopic study of these individuals while swallowing demonstrated significant pharyngeal dysfunction resulting in misdirected swallowing, leading to a four to five-fold increase in the risk of aspiration. A TOF recovery = 0.90 is required to return esophageal tone and pharyngeal coordination to baseline. NMB drugs also interfere with hypoxic ventilatory control. In vitro, while application of acetylcholine to the carotid body results in hyperventilation, application of anticholinergics eliminated the increase in neuronal activity of the carotid body sinus nerve that otherwise occurs with hypoxia. In awake volunteers who have received atracurium, vecuronium or pancuronium, with a train-of-four ratio of 0.70, the hypoxic ventilatory drive is reduced by 30%. A recent prospective, randomized, blinded study indicates that residual neuromuscular block after administration of pancuronium is associated with an increased incidence of postoperative pulmonary complications. Thus, an optimal level of neuromuscular recovery may be TOF ratio of > 0.90. Only with this degree of recovery do patients manifest normal swallowing, fully protect their airways, and resume normal respiratory function. It may require this more robust level of neuromuscular recovery to minimize the postoperative risk of aspiration and pneumonia.